The Foldscope is a $1 microscope made from waterproof paper that’s designed to decrease the barrier of entry to scientific exploration. Revealing the Invisible: The History of Glass and the Microscope, currently on view at the Corning Museum of Glass, explores the evolution of the microscope, from the simple 17th-century model by Antoni van Leeuwenhoek to elaborate ones like an 18th-century compound microscope adorned with ray skin. The exhibition concludes with the future of microscopy, which may be modest in material but is more accessible than the scientific instruments of the past. One of those contemporary designs is the Foldscope, a pocket-sized, $1 microscope that anyone can assemble like origami. The Foldscope was designed by Manu Prakash and Jim Cybulski at Stanford University and launched in a pilot program in 2014. Its waterproof paper body can be folded into existence from one sheet and used to hold microscope slides, to enhance your iPhone camera, or as a projector. Thousands of Foldscopes have been dispersed in over 130 countries, many to schools where students might not have access to more expensive microscopes. Now, through a Kickstarter campaign, you can acquire a Foldscope of your own or, even better, fulfill kit needs at schools around the world. Prakash, in his 2012 TED talk, notes that while education and engaging the public with everyday microscopic activity are essential goals of the Foldscope, it could also play an important public health role — for example, by making it easier to do field testing for malaria. Since it can magnify specimens up to 2,000 times and is compact, durable, and easily replaceable, the Foldscope offers a design solution for scientists working in such fluctuating environments as deserts and rainforests. 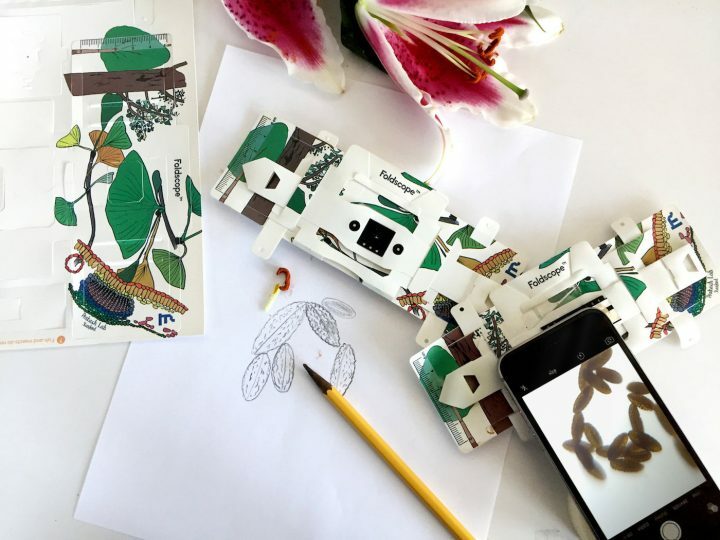 Foldscope: The Origami Paper Microscope is fundraising on Kickstarter through December 21.